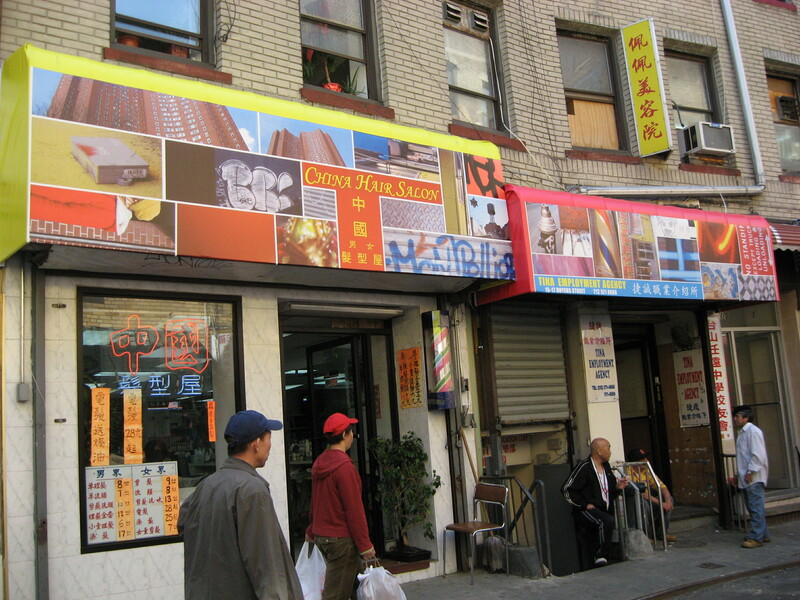 On Doyers Street between Pell St. and Bowery in Manhattan’s Chinatown. Made by TRYST in collaboration with workshop participants from the CPC after-school program, PS 124: Becky Chan, Jia Wen Chen, Natalie Chen, Jacquelyn Kan, Cody Fung, Amy Li, Kelly Tan, Michael Tse, Alice Vo, Connie Wu, Crystal Wu, Michelle Wu, Bonnie Yu, Bonnie Zeng, with store owners from 10, 15, 15-17 and 17 Doyers Street and Nadia Coen. Translator and Community Liaison: Mee Mee Chin, Production Manager: Holly Ko, Workshop Assistants: Lydia Bell and Kily Wong, Documentation: Arturo Vidich, Lydia Bell, Clarinda Mac Low, and workshop participants. 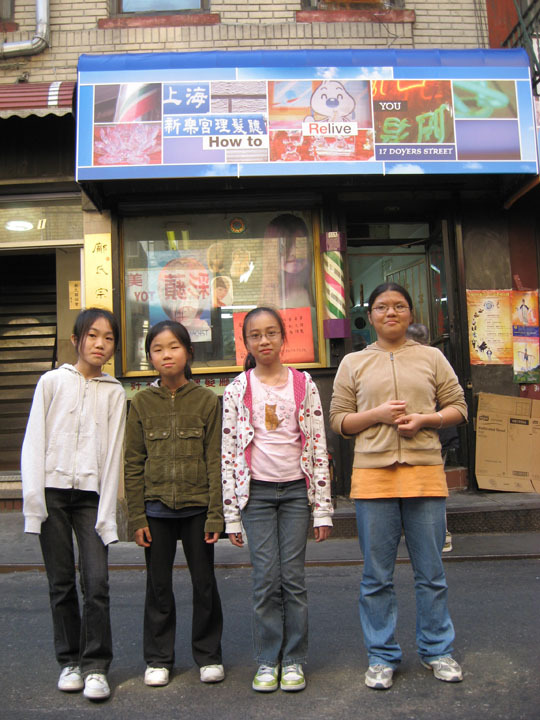 For Sign Language, TRYST collaborated with 14 fifth graders and 5 shop-owners to create temporary awnings for the hair salons of Doyers St. Tucked in a quietly historical nook, the signs bring life and color and a new perspective to the oldest street in Manhattan’s Chinatown, in New York City. Each sign is a secret map of the street, with the children’s original photos highlighting the details of Doyers St. designed by the children in collaboration with TRYST and Nadia Coen. 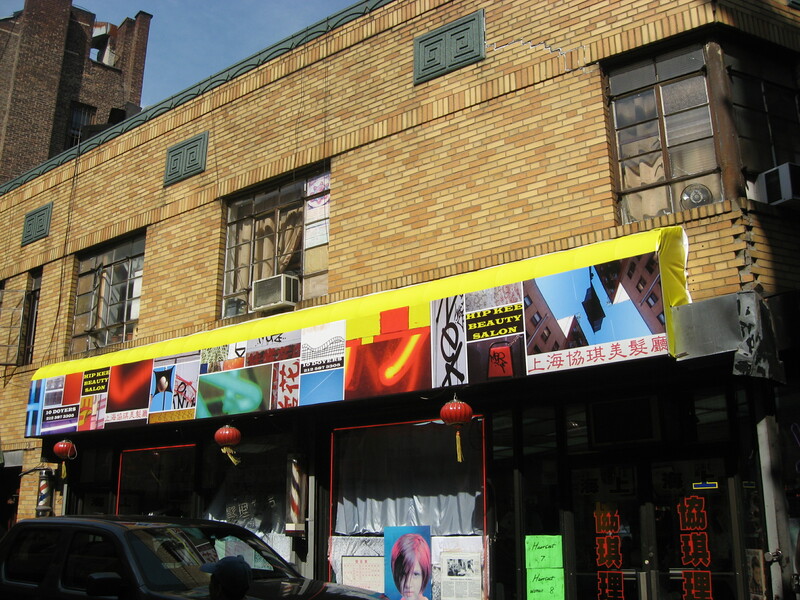 There was also a commission from Christina Seid, co-owner of the original Chinatown Ice Cream Factory, to make a new sign for the store that is now a permanent fixture. These signs were the culmination of a six-week workshop with children from the C.P.C. after-school program located in nearby P.S. 124. The workshop focused on relationships between commerce, advertisement, public space, language, imagery and design. The children gathered information and learned to appreciate aspects of their neighborhood in a new light through activities geared towards heightened perception and critical thinking. They examined existing signs, discussed concepts of advertising and commerce, and designed and presented to the community an alternative “sign” language in a highly visible venue that exhibited their original art in their own neighborhood. The video documentation is made up excerpts from a longer document directed and edited by Arturo Vidich. The photos show some of the signs and the artists.